The LA Auto Show comes around every November, giving us a chance to leave chilly old England behind and head for a Sun drenched Los Angeles. 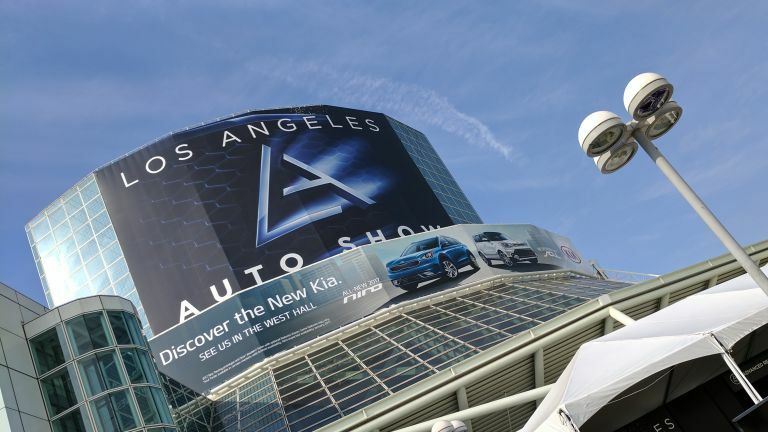 The 870,000 square-foot Los Angeles Convention isn't as large as Detroit, Tokyo or Geneva Motor Show, but the West Coast still hosts the biggest car makers and some notable launches. This year we got Jaguar's first electric car, an updated Mini Countryman, and Star Wars Edition Nissan, to highlight a few. Everyone was ready to hate Alfa Romeo's first SUV, but the Italian car maker has pulled it off with an aggressive design and impressive performance stats. The sport SUV was debuted in the range-topping Quadrifoglio guise. It packs Alfa's 503bhp 2.9-litre twin-turbo V6, capable of 0-62 mph in just 3.9 seconds and a top speed of 177 mph. It'll go on sale un the UK next year, with prices starting at £35,000, but expect the hottest model to be significantly more than that. Ian Callum, Director of Design at Jaguar, said the I-Pace is the company's most important car since the E-Type. The electric SUV concept looks amazing, it can reach 0-62mph in 4-seconds, and will have a range of 500km. Do you need any further convincing that its the star of the LA show? The I-Pace will hit the road in 2018, and isn't expected to change much between now and then. We love this bonkers Merc saloon. Th twin-turbo 4.0-litre V8 spits out a mind-boggling 603bhp and 627lb ft of torque. That'll help it shift from 0-62mph in a supercar-baiting 3.4 seconds and has a top speed of 186mph (with the optional AMG Driver’s Package). It looks ready to rip your face off, and even has a 'Drift Mode'. What's not to love? Well, apart from the price - expected it to land around £90,000. Mercedes also announced a Maybach S650 Cabriolet, it's probably very expensive, and comes complete with hideous alloys. Taking the fight t Ford and Ferrari next year at Le Mans is Porsche's striking new 911 GTE race car. Except, it's not a real 911, because Porsche has moved the engine in-front of the rear axle. That should improve weight distribution and make it more competitive, but it's sure made a lot of 911 purists angry. The Mini Countryman has received a styling update, it's chunkier and more sophisticated than the previous model, and now comes in eco-friendly hybrid engine. This combines a three-litre petrol engine with an 88bhp electric motor. Prices start at £22,465. Capitalising on the hype around Rogue One, Nissan has produced a limited edition SUV to celebrate the new film. Making just 5400 examples, the Rogue has a few decals and badges. It also comes with a replica Stormtrooper helmet. Sorry UK Star Wars fans - this is US only. The Si is a warm addition to the Honda Civiv range, it sits below the Type-R and will cost less. There are now specific details yet, but as the Type-R produces 300 bph, you can expect the Si to pump out around 230 bhp. The VW Atlas is a full-sized seven-seat SUV designed for America, with enough space for seven adults and their luggage. It won't be making its way over to Europe. The face-lifted Volkswagen Golf will be making its way over here however, with improvements to the infotainment system, connectivity, and fuel efficiency. Yes, this really is a brand new car. Nine Jaguar XKSS cars were lost in a fire in 1957 - fifty-nine years later Jaguar is finally completing the production run of the XKSS. Every aspect of the car is identical to the original model, using the genuine schematics and 3D scans of the surviving vehicles. Want one? Tough, they're already sold out. The already impressive V90 has been jacked-up for more ground clearance, and clad in robust plastic to protect the bodywork. Expect the same array of excellent tech and engines. We really rate this cross country estate, it's just a shame we weren't around to take a proper picture of it.